It is my duty as a citizen…. And so the adventure began. We watched a movie, I lost horribly while playing him on a video game, then the hunger struck. Him: I’m hungry, but I want a burger. Next thing we were off headed to Fredonia,Az which is about ten miles away from Kanab. This specific restaurant I had never been to, never knew about, and no one told me about it. It was a gem the was hidden along the main street in town. 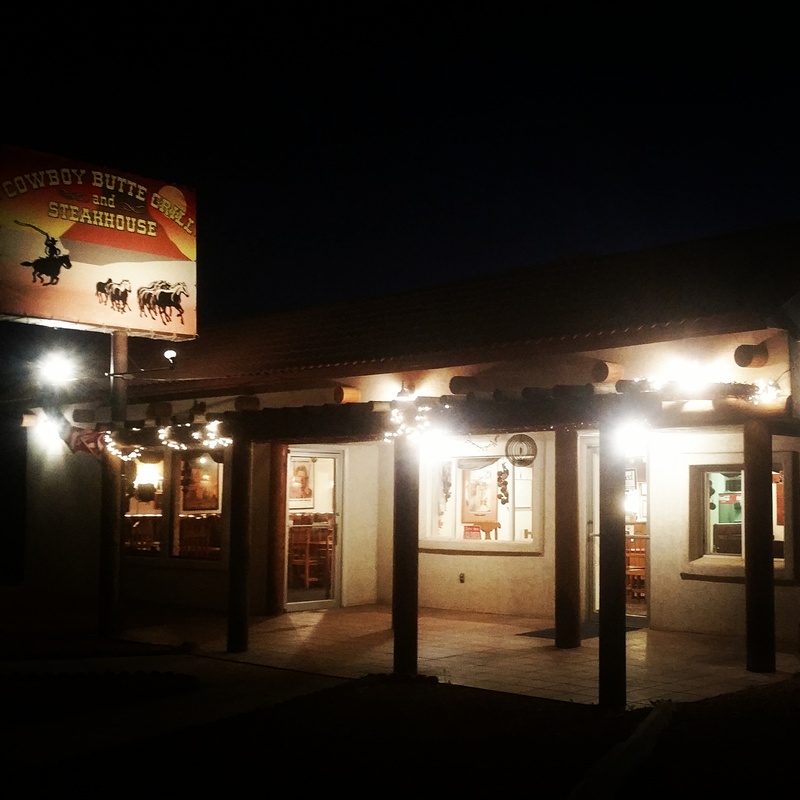 The Cowboy Butte Grill and Steakhouse Was light up with some nice twinkling lights that went just beautifully with the sunset. There were two areas for sitting, which was comfortable and cozy. Our waitress was very nice and you could tell she was just a sweet caring person by her smile. We were seated and asked for out drink orders, see I knew the burgers were great, I had one the day before, so my initial though was to try something different, but when she came back for our orders I caved. I ordered the exact same thing I had gotten the day before. 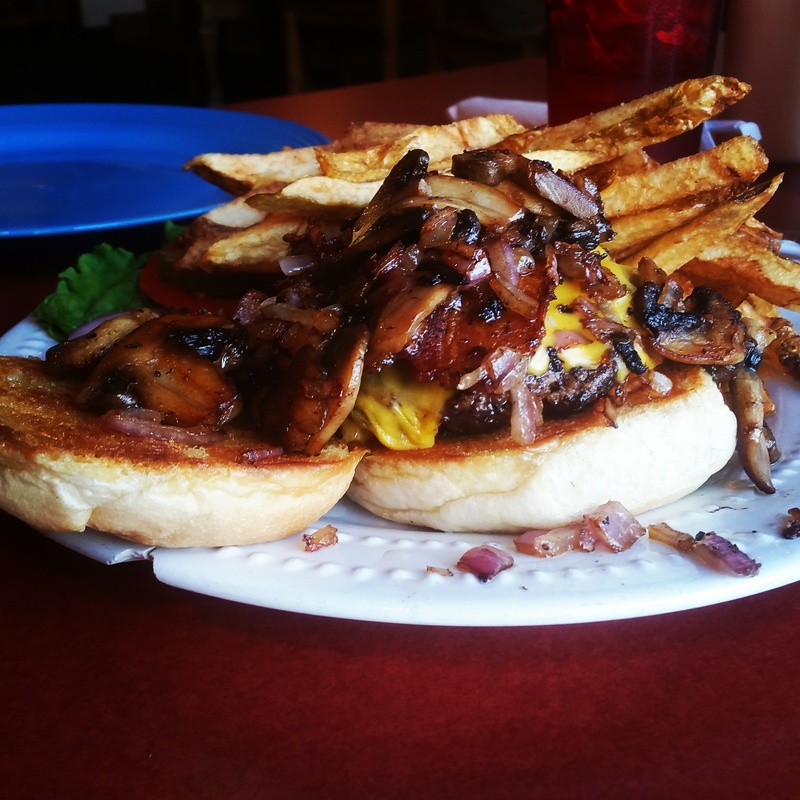 A bacon cheddar cheese burger with grilled onions and mushrooms. I know what your thinking, its big, its gorgeous, and yes, it WAS delicious! They make the fries there fresh everyday, the bacon was actually crispy! imagine that, I usually always have to ask for it like that. The buns were toasted and had this beautiful crunch to it every time you took a bite. The patty had this perfect crust on it, was a bite of pure flavor every time. The grilled onions and mushrooms just added a whole new element that kept me coming back for more. You know how much I nit-pic on food if it isn’t hot, didn’t even cross my mind once here! The fries were done perfectly, and were among the first to be consumed. I think I said “omg this is soo good” after every bite. Even a table across from us started noticing and making comments about how good it looked. When they got their foo a short time after you should have seen how their faces lit up after taking the first couple bites, then we all started laughing about how delicious the food was! 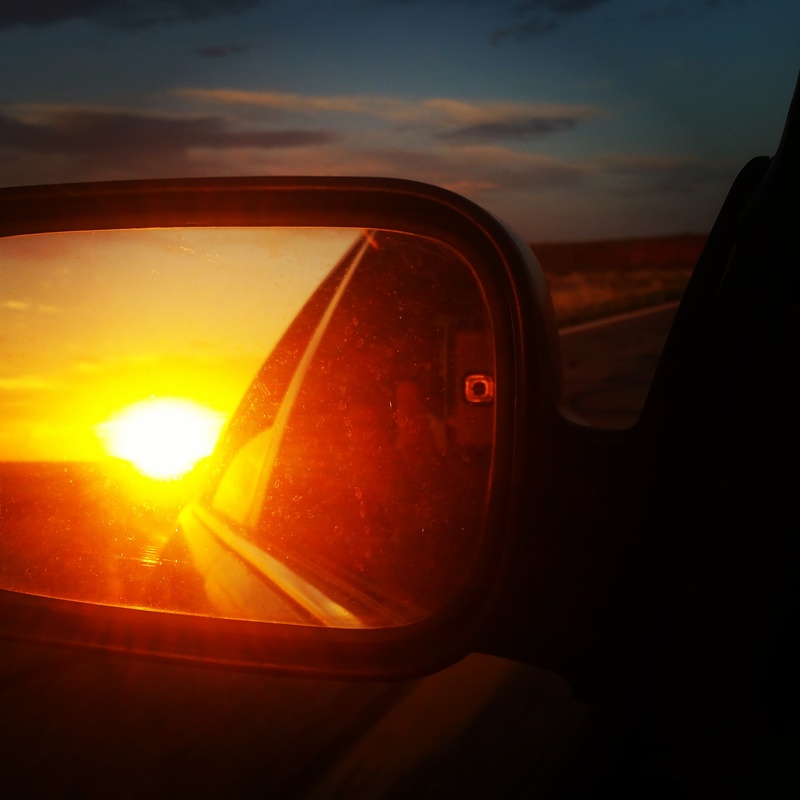 A picture of the sunset while driving into town. ← Its the small things sometimes!